Temporary or pop-up architecture is currently in vogue — it is dynamic, nomadic, and allows for great creativity. 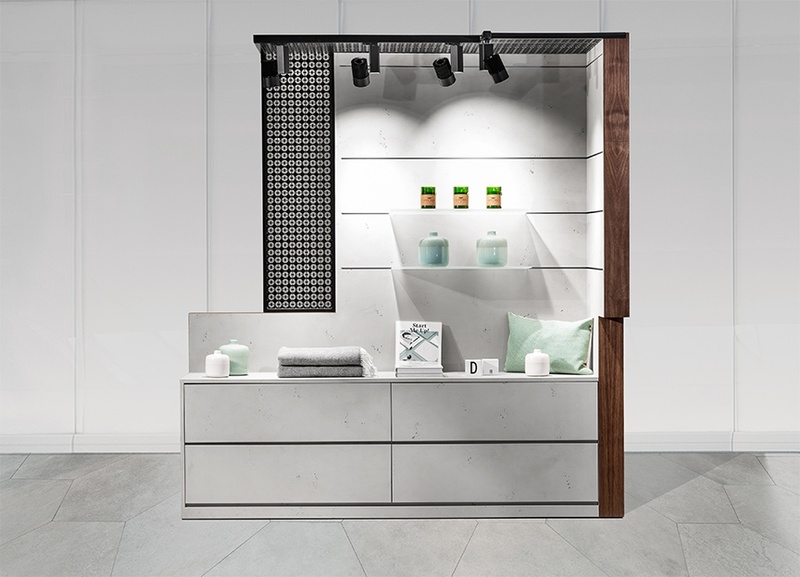 Dittel Architekten, a firm based in Stuttgart, Germany, has created an "out-of-the-box" solution with the Pop Up Box, which offers a customizable presentation area in a mobile space for retailers. The Pop Up Box. Image courtesy of Dittel Architekten GmbH. At Dittel Architekten, architects, interior designers, and communication designers work together to create unique projects. To implement their ideas, they rely on Vectorworks Architect design and BIM software. One of their creations is the Pop Up Box — a convertible retail space that combines technology, utility, and design in one cube. 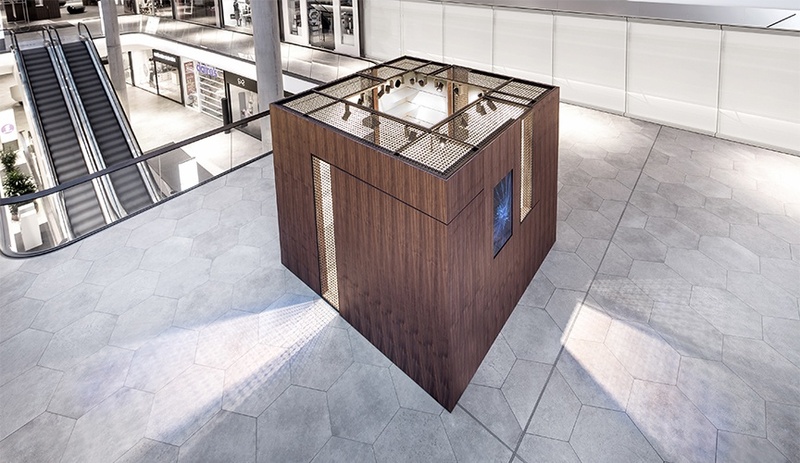 The kiosk-style cube was developed for the Gerber shopping center in Stuttgart. 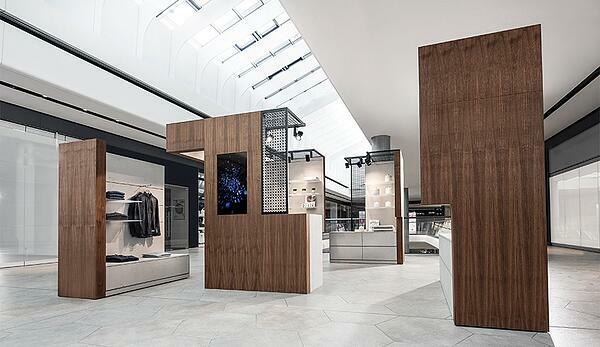 The retail space can open up to give customers the opportunity to go inside and interact with the displays. At night, the individual sections can be joined together to form a compact, lockable cube. Perforated inserts then provide views into the interior of the box. The opened Pop Up Box in the shopping center Gerber in Stuttgart. Image courtesy of Dittel Architekten GmbH. "We use Vectorworks from the first draft to the implementation planning. For the 'Tetris Game' idea of the Pop Up Box, the 3D tools were ideal to support the spatial concept." A central technical feature of the cube is the integrated lifting system: The retailer can move the individual elements freely and create a customized, barrier-free sales room of about 20 to 30 square meters. The shopfitting system on the inside allows for a flexible merchandise presentation. Two monitors on the outside walls are visually recorded. The main element is powered by electricity from floor outlets, which powers batteries in the other modules. An inside view of the Pop Up Box. Image courtesy of Dittel Architekten GmbH. The innovative and flexible retail solution was awarded the German Design Award in 2017 and is currently featured in the article "The Rise of Temporary and Pop-Up Architecture" in Architect Magazine.